In second part of this two-part article, Despina Mavromati, Managing Counsel at Court of Arbitration for Sport (CAS), analyses the specific procedural rules of the CAS Anti-Doping Division (ADD), as the CAS Panels at the Rio Olympic Games interpreted them. The article also compares these rules to the procedural rules of the (general) CAS Ad Hoc Division (AHD) and to the (permanent) CAS in Lausanne, Switzerland. Part one offered an introduction to the ADD and the AHD Rules and examines their general scope and the jurisdiction of both divisions. Part two analyses the structure of the CAS ad hoc offices and the conduct of the ad hoc proceedings, particularly in terms of evidence, applicable law and provisional measures. This article is essential reading for any sports lawyer who represents or plans to represent clients in sports disputes before the CAS. Similar to the structure of the permanent CAS in Lausanne1 and the CAS AHD,2 the CAS ADD comprises a President, a Deputy President, arbitrators appearing on a special list and a Court Office.3 The particularity of the special list of the ADD arbitrators is that they may not act for the regular CAS AHD during the same edition of the OG or later, in case of referral of the case to the permanent CAS in Lausanne or in a case related to the same edition of the OG.4 An analogous provision was added to the CAS AHD Rules to ensure that the two divisions remain independent of each other.5 ADD arbitrators are chosen from the General List of CAS Arbitrators, in the same way as in the AHD Rules.6 The list is set up by the ICAS Board7 and can subsequently be amended if needed (e.g. in case of increased work load or in the event that some of the arbitrators need to be removed or replaced for some urgent reason).8 The arbitrators are selected taking into consideration the geographical distribution, the absence of links between the candidates and the sporting bodies and the qualification and experience of the arbitrators. Apart from the costs of experts and interpreters in the AHD procedures, the entire ad hoc proceedings are free of charge and it is even possible to have recourse to a pro bono counsel at the site of the OG, with a list of pro bono counsel established prior to each version of the OG. Article 8.1.2 of the IOC ADR refers to the CAS ADD Rules for the constitution of the panel. In essence, the President of the CAS ADD appoints either a Sole Arbitrator or a Panel of three Arbitrators. The CAS ADD Rules do not define the criteria for determining the number of Arbitrators but general factors such as the complexity of the case should speak in favour of a Panel of three Arbitrators.18 Under the AHD procedure (Article 11) the sole arbitrator is appointed only in exceptional circumstances, the general rule being a Panel of three arbitrators.19 The main difference between the regular proceedings under the CAS Code the ad hoc proceedings (both the AHD and the ADD) is that in the latter, the parties do not play an active role in the constitution of the Panel or the number of the Arbitrators, in order to save time and reduce the risk of challenges of arbitrators. Article 14 of the ADD Rules is entitled “Provisional suspensions”. The Panel (or the President of the Division if the Panel has not yet been appointed) may rule on an application for a provisional suspension as defined in the IOC ADR. The IOC ADR provide some guidance and additional information regarding provisional suspensions. Article 7.6 of the rules foresees two different types of suspension, i.e. the mandatory suspension and the optional suspension. The former occurs when the analysis of an A sample has resulted in an AAF for a prohibited substance that is not a specified substance (Art. 4.2.2 WADC), or for a prohibited method, and in the absence of an applicable Therapeutic Use Exemption (TUE). The CAS ADD does not seem to have an alternative but to impose a provisional suspension promptly after the notification of the AAF. The “optional provisional suspension” applies to AAF for a specified substance (or for violations not covered by Article 7.6.1 on the mandatory provisional suspension). In both cases, if a provisional suspension is imposed, the athlete (or other person) will have the opportunity for a provisional hearing before the CAS ADD and an opportunity for an expedited final hearing before the CAS ADD, but also the right to appeal against the provisional suspension under Article 12.2 IOC ADR. It must be noted that the only person having standing to appeal against a provisional suspension is the athlete (or the person provisionally suspended). Article 14 of the ADD Rules differs from Article 14 of the AHD Rules, as in the latter case the applicant usually requests the CAS AHD to stay the decision appealed against or to be granted interim relief.28 The different procedure regarding interim relief before the CAS AHD is as follows: in principle, applicants for provisional measures are the athlete / the IF or the NOC. The Panel may grant interim relief even without hearing the respondent (in cases of extreme urgency). A decision to grant interim relief has only a provisional effect and is replaced by the final award of Article 20 of the CAS AHD Rules. The criteria employed by the Panel / Division President when deciding on the provisional measures are similar to the ones enumerated in Article R37 CAS Code (irreparable harm, likelihood of success on the merits and balance of interests).29 These criteria do not appear in the wording of Article 14 of the ADD Rules, as this is a first-instance procedure. As seen above, the ADD Rules deal with alleged anti-doping rule violations and cases are referred to the CAS ADD (which acts as the first-instance body) through a written application filed by the IOC, as soon as the latter asserts an anti-doping rule violation.34 The content of the application is described in Article 10 of the CAS ADD Rules and comprises, inter alia, the coordinates of the athlete / other person involved / their representative at the site of the OG, a brief statement of the material facts and legal arguments and a request for relief. The provision is almost identical to Article 10 of the CAS AHD Rules. The filing of the application triggers the beginning of the arbitration procedure. In most cases the application is filed through a standard form that is available for the parties at the Court Office. This application is then served on the respondent and any interested parties, along with the notice for the hearing in very urgent cases. Article 15 is the lengthiest provision of the CAS ADD Rules and deals with the procedure before the Panel (the same provision can also be found in Article 15 of the CAS AHD Rules). It is first specified that any objection to jurisdiction has to be raised at the outset of the proceedings or at the beginning of the hearing. This reflects the general provision on jurisdictional challenges of the CAS Code (which, in turn, is in line with the 12th chapter of the Swiss PILA and, most specifically, Article 186 thereof). Article 16 ADD Rules provides that “the Panel has full power to establish the facts on which the application is based”. This is logical because the ADD proceedings are first-instance proceedings. The same wording is used in Article 16 of the CAS AHD Rules but the AHD proceedings are, in principle, appeal proceedings (once the internal remedies have been exhausted). Article 12.1.1 of the IOC ADR goes even further and provides that the “scope of review on appeal includes all issues relevant to the matter and is expressly not limited to the issues or scope of review before the initial decision maker”.41 Under Article 12.1.2 of the same rules, CAS does not need to give deference to the decision under appeal. In respect of the applicable law to the merits of the case, the Panel primarily applies the IOC ADR, along with the applicable anti-doping regulations (e.g. of the specific federation), Swiss law but also general principles of law.42> Throughout the years, the CAS and the CAS AHD have created a solid case law regarding the application of general principles of law, which can be applied in addition to the otherwise applicable rules.43 The applicable law to the merits before the AHD is, pursuant to Article 17 of the AHD Rules, the “applicable regulations”, general principles of law “and the rules of law, the application of which deems appropriate”. In most cases, the Panel will apply the “applicable regulations”, which are the rules of the IF, the OC or the WADC. In doping-related cases in appeal brought before the AHD, the Panel might need to apply the pertinent provisions of the IOC ADR, where applicable. The time limit to issue the decision is laid down in Article 18 of the CAS ADD Rules (identical to Article 18 of the CAS AHD Rules). During the OG, the time limit is 24 hours (starting from the conclusion of the hearing or, in the absence of a hearing, from the conclusion of the evidentiary proceedings).44 Article 8.2.3 of the IOC ADR specifies that the CAS ADD must render a timely and reasoned award. The extension of the time limit (by the ADD Division President) is exceptional “if circumstances so require”. Outside the period of the OG, Article 18 ADD Rules provides that the Panel shall give a decision “within a reasonable time”. While the award is immediately enforceable upon its notification,61 it may be appealed to the CAS AHD (under the AHD Rules) or the CAS in Lausanne within 21 days from the date of receipt of the award by the appealing party (in accordance with Article R47 ff. of the CAS Code).62 The difference between ADD and AHD procedures is that the latter has the effect of a final arbitral award rendered by the (permanent) CAS in Lausanne, and the parties can only file a motion to set aside the award in accordance with the relevant provisions of Swiss PILA (and, more specifically, Article 190 para. 2 thereof). CAS Ad Hoc Divisions at the Olympic Games have been a very successful tool for the resolution of sports disputes. Since the OG in Atlanta in 1996, the CAS AHD have been providing athletes and other participants in the OG with a swift, efficient and free dispute resolution mechanism for a variety of disputes arising out of the OG.65 For the first time at the 2016 Rio OG, CAS has created a special, first-instance anti-doping tribunal for all alleged anti-doping rule violations occurring during the period of the OG. The ICAS Board has adopted specific rules applicable to these procedures, which apply along with the procedural and substantive provisions of the IOC ADR. The CAS ADD rules are, in essence, very similar (and in many provisions identical) to the respective provisions of the CAS AHD and the major differences arise out of the first instance character of the ADD procedure. From a procedural viewpoint, there is no need to exhaust internal remedies before seizing the ADD: this is a condition for jurisdiction under the AHD Rules (subject to some exceptions). Furthermore, the scope of the ADD jurisdiction is considerably narrower than the one of the AHD (which deals with all disputes arising out of the OG), even if the AHD has established a general policy of not interfering with the so-called “field of play” decisions rendered by officials as well as technical decisions. The time limit to issue the ADD award is 24 hours (starting from the conclusion of the hearing or, in the absence of a hearing, from the conclusion of the evidentiary proceedings), with the possibility to extent the time limit “if circumstances so require” or if the Panel decides to render a final award outside the period of the OG. Under the AHD Rules, and although the time limit to issue an award is, again, 24 hours, CAS AHD Panels have the possibility to choose between the issuance of a final award or a referral to the CAS in Lausanne (in accordance with the CAS Code). Therefore, the main difference between the two procedures is that the referral to the CAS in Lausanne under the AHD Rules will entail the application of the relevant provisions of the CAS Code. A further difference between the two procedures relates to the effect of the award: while the ADD award is immediately enforceable upon its notification, it may be appealed to the CAS AHD (under the AHD Rules) or the CAS in Lausanne within 21 days from the date of receipt of the award by the appealing party (in accordance with Article R47 ff. of the CAS Code). The difference between ADD and AHD procedures is that the latter has the effect of a final award rendered by the (permanent) CAS in Lausanne, and the parties can only file a motion to set aside the arbitral award in accordance with the relevant provisions of Swiss PILA (and, more specifically, Article 190 para. 2 thereof). Finally, an additional major difference between the two procedures relates to the provisional measures: the ADD Rules refer to “provisional suspensions”, while the AHD Rules provide for the “stay of decision challenged and preliminary relief of extreme urgency”. It seems that the procedure for pronouncing the provisional suspension under the ADD Rules is much more technical, and the Panel orders such suspension almost systematically. Against this background, the procedure of the AHD is similar to the procedure foreseen in the general provisions of Article R37 of the CAS Code, with all the relevant criteria (irreparable harm, likelihood of success on the merits and balance of interests) applying also to the AHD. Overall, the importance of the CAS and its ad hoc divisions in the resolution of sports-related – and in particular – doping-related disputes is growing at an ever increasing pace. At the Rio OG, the CAS AHD registered 28 procedures in total, almost two times more than its previous record (15 registered cases at the Sydney OG in 2000). The ADD was called to rule on eight doping-related cases that would otherwise have been adjudicated by the IOC Executive Board. The newly drafted procedural rules were “tested” and applied for the first time at the Rio OG. The ADD procedures will create a new body of jurisprudence, which will influence the future interpretation of the relevant rules. More importantly, though, the delegation of the doping-related procedures by the IOC Executive Board to the CAS ADD must be seen as an important step towards increasing substantially the independence of anti-doping testing procedures from sports organizations. See S6 para. 2 (3rd and 4th point) of the CAS Code. See Article 2 (in fine) and Article 4 of the CAS AHD Rules. See Article 2 of the CAS ADD Rules. See Article 3 of the CAS ADD Rules. See Article 3 of the CAS AHD Rules. See Article 2 of the CAS AHD Rules. The ICAS Board includes only five members out of the 20 ICAS members, namely the ICAS President, the two ICAS Vice-Presidents, and the Presidents of the CAS ordinary – and appeals Division, respectively). The list currently comprises almost 400 arbitrators from different parts of the world and is available at www.tas-cas.org. See Article 4 of the CAS ADD Rules. The President of the ADD has various roles which are described in the relevant provisions of the ADD rules: the President appoints the Panel (Article 11 ADD Rules), decides on challenges of arbitrators and their removal (Article 13 ADD Rules), may rule on an application for provisional measures (Article 14 ADD Rules), decides on the extension of the time limit to issue the award (Article 18 ADD Rules) and also reviews the form of the award (Article 19 ADD Rules). See Article 5 of the CAS AHD Rules. See Article 6 of the CAS ADD Rules and Article 6 of the CAS AHD Rules. These are also the two authentic languages of the CAS ADD Rules (in case of discrepancy, however, the English version shall prevail under Article 23 of the CAS ADD – and the CAS AHD - Rules). See TAS JO 16/27 FFN & A. Muller & CNOSF c. FINA, award of 20 August 2016. 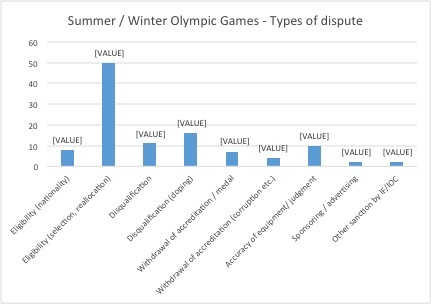 See more on Article R29 CAS Code in Despina Mavromati / Matthieu Reeb, The Code of the Court of Arbitration for Sport: Commentary, Cases and Materials, Wolters Kluwer 2015, pp. 76-89. See the statistics on the CAS AHD procedures at the end of the paper. From the Rio OG see e.g. CAS OG AD 16/04, IOC v. S. Danekova, award of 12 August 2016, para. 23. See more on the seat of CAS arbitration and the application of the 12th chapter of the Swiss Private International Law Act (Swiss PILA) in Despina Mavromati / Matthieu Reeb (fn 14 above), pp. 63-74. See also some general criteria from the practice of the CAS Court Office in Lausanne according to the CAS Rules in Despina Mavromati / Matthieu Reeb (fn. 14 above), ad Article R40 (CAS Ordinary procedures), pp. 269-271 and Article R50 (Appeal procedures), pp. 442-446. See the respective appointment procedure in Article 11 CAS AHD Rules. See more on Article R33 CAS Code in Despina Mavromati / Matthieu Reeb (fn. 14 above), ad Article R33, pp. 133-156. See the identical provision of Article 12 of the CAS AHD Rules. The prohibition exists also under the CAS Code, see S18 CAS Code, see also Despina Mavromati / Matthieu Reeb, (fn. 14 above) ad Article R33, p. 145 f.
The provision exists also in the regular CAS proceedings, see e.g. the difference between the submission of two relevant procedures to the same panel from consolidation of proceedings in Despina Mavromati / Matthieu Reeb, (fn. 14 above), ad Article R50, p. 446 f.
The same is foreseen in Article 11 AHD Rules and the possibility has been used in some CAS AHD procedures so far. See e.g. CAS OG 08/ 008 & 009, CONI & SOC v. ISAF, award of 24 August 2008, at 3.2.2. The two procedures were assigned (by the Division President) to the same panel (S. Netzle, R. McLaren & M. Echeverria) because they arose out of the same set of facts. See Article 7.6.3.1 of the IOC ADR. See Article 7.6.4 of the IOC ADR. See e.g. CAS OG AD 16/05 IOC v. X. Chen, award of 18 August 2016. See also CAS OG AD 16/03 IOC v. K. Da Silva Ramos, award of 18 August 2016, where the athlete accepted a provisional suspension on a voluntary basis and did not request a hearing. See CAS OG AD 16/02 IOC v. T. Zielinski, award of 12 August 2016 para. 19. This also explains why the provisional suspension is so common in ADD procedures: from the eight cases decided at the Rio OG, provisional suspension was imposed (or was voluntarily accepted by the athlete) in all seven cases, with the exception of the first procedure CAS OG AD 16/01, P. Sozykine & RYF v. World Sailing (WS) & IOC, award of 14 August 2016 (which was dismissed for lack of jurisdiction of the CAS ADD). See e.g. CAS OG 12/09, N. Gezzar v. FFA, award of 2 August 2012, at 6.4-6.17. The Panel (M. Coccia, M. Bernasconi & G. Ndiaye) dismissed the applicant’s request to lift the provisional suspension due to lack of chances to succeed on the merits. See also CAS OG 02/ 003, COA v. ISU, Procedural Order on an application for extremely urgent preliminary relief of 14 February 2002, at 2.3. In this case the preliminary relief was granted because the applicant could otherwise suffer irreparable harm. See more on Article R30 of the CAS Rules in Despina Mavromati / Matthieu Reeb (fn. 44 above), pp. 91-105. See also the analogous provision of Article 8 of the CAS AHD Rules. See Article 9 (a) in fine of the CAS ADD Rules. See Article 9 (b) of the CAS ADD Rules. See the identical provision of Article 9 of the CAS AHD Rules. See Article 8.1.1 of the IOC ADR. The application is then served to the IOC legal affairs department, to the athlete / other person involved, to the NOCs and the IFs concerned and to WADA. See Article 13 (b) of the CAS ADD Rules. See, however, CAS OG AD 16/07 IOC v. I. Artykov, award of 18 August 2016, para. 12 f., where none of the parties had filed written submissions by the set deadline, and the Panel, referring to Art. 15(c) and (e) of the CAS ADD Rules, informed the Parties that it considered itself sufficiently well informed to render a decision without an oral hearing. See Articles 7.7.2, 7.7.3 and 7.8 of the IOC ADR. See Article 13 (c) and (d) of the CAS ADD Rules. The freedom of the Panel is not unlimited but, once again, limited by the general principles of due process: in this respect, the criteria for admitting / refusing evidence submitted by the parties could be similar to CAS arbitration in Lausanne, adapted to the very short time frame of the ADD procedures. Also, as indicated in Article 13 (f) ADD Rules (“Proceedings outside the period of the OG”), the proceedings are conducted by the panel taking into consideration the right of the parties to be heard “within a reasonable period of time”. See e.g. CAS OG 04/002, I. Slavkov v. IOC, award of 16 August 2004, at 1.6. The applicant had indicated that he would be unable to attend the hearing but had asked the Panel to proceed with his case and render an award. This is inspired by Article R57 of the CAS Code, which establishes CAS’ full power to review “the facts and the law”. The main practical consequence of this provision is that (most of the) procedural deficiencies occurred in the previous instance may be cured before the CAS proceedings, see Despina Mavromati / Matthieu Reeb (fn. 14 above), pp. 511-515. On the broad scope of review by the CAS see Graeme Mew / Mary Jane Richards, More than just a Game: Resolving Disputes in Modern Sport, paper presented at 14th Commonwealth Law Conference, 2005, London, England, p. 27 f.
See e.g. OG AD 16/02 IOC v. T. Zielinski, award of 12 August 2016, paras. 30 f.
See e.g. CAS 98/200 AEK Athens & SK Slavia Prague v. UEFA, award of 23 August 1999, at 156. The general principles include e.g. the principle of good faith (CAS 2002/O/373, COC & B. Scott v. IOC), the doctrine of estoppel (CAS 98/200 AEK Athens & SK Slavia Prague v. UEFA; CAS 2002/O/401 IAAF v. USATF), the contra proferentem rule (CAS 2013/A/3316 WADA v. Ch. Bataa; CAS 2013/A/3274 M. Glasner v. FINA), etc. See Article 20 (a) of the ADD Rules. See Article 20 (b) of the ADD Rules. See e.g. OG AD 16/02 IOC v. T. Zielinski, award of 12 August 2016, where the Panel issued 4 consecutive procedural directions to deal with different procedural matters each time. See Article 20 (a) of the AHD Rules. See Article 20 (c) (i) of the AHD Rules. This was e.g. the case in CAS OG 08 / 008, V. Samusgashev v. FILA, award of 23 August 2008, at 1.3 & 1.4. The Panel referred ex officio the case to the permanent CAS in Lausanne because the federation’s representatives had already left the site of the OG. The Panel issued directions and gave the claimant a deadline in order to bring the case to the CAS. See also CAS OG 08 / 009, NANOC v. IAAF, award of 24 August 2008, at 1.5. We must note that, in most cases, referral to the permanent CAS in Lausanne is decided towards the end of the period of the OG. See also CAS OG 04 / 010, Y. Tae Young v. FIG, award of 29 August 2004, at 7 (the Panel found that the resolution of the dispute was no longer of extreme urgency). See Richard McLaren / Geoff Cowper-Smith, Arbitrating Sports: The Beijing Summer Olympic Games: Decisions from the CAS and IOC, Pepperdine Dispute Resolution Law Journal, 2010, Vol. 10, Issue 1 (“The Beijing Summer Olympic Games”), p. 106. The authors supported that, when a case is brought to the CAS in Lausanne, athletes (like Ara Abrahamian and Martina Churandy) are prevented from resolving their disputes (in case with respect to their possession of their medals) in a timely manner. See CAS 2008/A/1749, A. Abrahamian v. FILA, award of 23 June 2009 and CAS 2008/A/1641, NAOC v. IAAF & USOC, award of 6 March 2009. On the time limits to file an appeal see Despina Mavromati / Matthieu Reeb (fn. 44 above), ad Article R49, pp. 425-440. The parties cannot subsequently question the composition of the arbitral tribunal in accordance with the CAS Code, see Article 20 (c) (iii) of the AHD Rules. This is also provided in Articles R46 (ordinary proceedings) and R59 (appeal proceedings) of the CAS Code (which is an adaptation of the more general provision of Article 189 para. 2 Swiss PILA). See more in Despina Mavromati / Matthieu Reeb (fn. 14 above), ad Article R46, p. 365. Article 19 of the CAS ADD Rules. See Articles R46 and R59 of the CAS Code. See e.g. CAS OG 06 / 005 & 007, A. Abernathy v. ILF et al., consent award of 17 February 2006. See Article 19 of the CAS ADD Rules. See Article 7.8 of the IOC ADR (“notification of result management decisions”). Under the conditions set in Article 12.2.2 of the IOC ADR. See Article 8.2.3 of the IOC ADR. It is for the relevant NOC to inform the national anti-doping authority. See also Article 12.1 of the IOC ADR. See also Article 8.2.4 and Article 12.5 of the IOC ADR. 12.5 The latter provision also foresees the possibility to appeal for non-parties to the first-instance proceedings, provided that they request a copy of the case within fifteen days from notice of the decision. WADA will have 21 days “after the last day on which any other party in the case could have appealed” or 21 days “after WADA’s receipt of the complete file relating to the decision”. See Articles 8.2.4 and 13 of the IOC ADR. The Awards are made public only if an athlete is found to have committed an anti-doping rule violation. See Article 13.3.6 of the IOC ADR. See the statistics on the types of disputes brought before the CAS AHD at the end of the paper.